Shokoso Garden (尚古荘) is a traditional Japanese style garden built on the grounds of the ruins of Nishio Castle. The remains of a tower and inner moat of the castle can be seen as a part of the garden landscape. In this garden you can also find a tea ceremony room called Fugen-an, a guest hall and a small arbor from where you can appreciate the garden. Closed on: Monday, Next day of Holiday. Shokoen was built in early Showa Period. It offers great landscape of Kyoto. 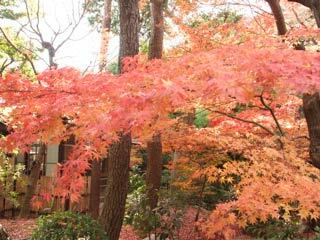 In falls, Japanese maple will change its color to beautiful red. You can rent this place.